For other uses, see Higher Education (disambiguation). "Higher learning" redirects here. For other uses, see Higher Learning (disambiguation). For broader coverage of this topic, see Tertiary education. 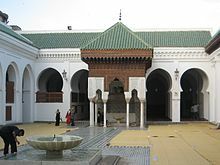 The University of al-Qarawiyyin founded by Fatima al-Fihri in Fez, Morocco is the world's oldest existing, continually operating and the first degree awarding institution of higher learning in the world according to UNESCO and Guinness World Records. 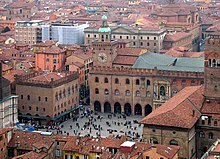 University of Bologna, located in Bologna, Italy, is the oldest institution of higher education in the Western world. The University of Pennsylvania considers itself the first institution in the United States of America to use the term "university" in its name. 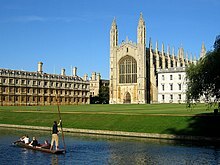 The University of Cambridge is an institution of higher learning in Cambridge, United Kingdom. McGill University is an institution of higher learning in Montreal, Quebec, Canada and one of two Canadian members of the Association of American Universities. The Moscow State University is an institution of higher learning in Moscow, Russia. The Jeffersonian architecture of Tsinghua University, an institution of higher learning in Beijing, China. The University of Tokyo is an institution of higher learning in Tokyo, Japan. The University of São Paulo is an institution of higher learning in São Paulo, Brazil. Higher education (also called post-secondary education, third-level or tertiary education) is an optional final stage of formal learning that occurs after completion of secondary education. Often delivered at universities, academies, colleges, seminaries, conservatories, and institutes of technology, higher education is also available through certain college-level institutions, including vocational schools, trade schools, and other career colleges that award academic degrees or professional certifications. Tertiary education at non-degree level is sometimes referred to as further education or continuing education as distinct from higher education. The right of access to higher education is mentioned in a number of international human rights instruments. The UN International Covenant on Economic, Social and Cultural Rights of 1966 declares, in Article 13, that "higher education shall be made equally accessible to all, on the basis of capacity, by every appropriate means, and in particular by the progressive introduction of free education". In Europe, Article 2 of the First Protocol to the European Convention on Human Rights, adopted in 1950, obliges all signatory parties to guarantee the right to education. In the days when few pupils progressed beyond primary education or basic education, the term "higher education" was often used to refer to secondary education, which can create some confusion. This is the origin of the term high school for various schools for children between the ages of 14 and 18 (United States) or 11 and 18 (UK and Australia). Higher education includes teaching, research, exacting applied work (e.g. in medical schools and dental schools), and social services activities of universities. Within the realm of teaching, it includes both the undergraduate level, and beyond that, graduate-level (or postgraduate level). The latter level of education is often referred to as graduate school, especially in North America. In addition to the skills that are specific to any particular degree, potential employers in any profession are looking for evidence of critical thinking and analytical reasoning skills, teamworking skills, information literacy, ethical judgment, decision-making skills, fluency in speaking and writing, problem solving skills, and a wide knowledge of liberal arts and sciences. Since World War II, developed and many developing countries have increased the participation of the age group who mostly studies higher education from the elite rate, of up to 15 per cent, to the mass rate of 16 to 50 per cent. In many developed countries, participation in higher education has continued to increase towards universal or, what Trow later called, open access, where over half of the relevant age group participate in higher education. Higher education is important to national economies, both as an industry, in its own right, and as a source of trained and educated personnel for the rest of the economy. College educated workers have commanded a measurable wage premium and are much less likely to become unemployed than less educated workers. However, the admission of so many students of only average ability to higher education inevitably requires a decline in academic standards, facilitated by grade inflation. Also, the supply of graduates in many fields of study is exceeding the demand for their skills, which aggravates graduate unemployment, underemployment, credentialism and educational inflation. There are undeniably certain kinds of knowledge that must be of a general nature and, more importantly, a certain cultivation of the mind and character that nobody can afford to be without. People obviously cannot be good craftworkers, merchants, soldiers or businessmen unless, regardless of their occupation, they are good, upstanding and – according to their condition – well-informed human beings and citizens. If this basis is laid through schooling, vocational skills are easily acquired later on, and a person is always free to move from one occupation to another, as so often happens in life. The philosopher Julian Nida-Rümelin criticized discrepancies between Humboldt's ideals and the contemporary European education policy, which narrowly understands education as a preparation for the labor market, and argued that we need to decide between McKinsey and Humboldt. Demonstrated ability in reading, mathematics, and writing, as typically measured in the United States by the SAT or similar tests such as the ACT, have often replaced colleges' individual entrance exams, and is often required for admission to higher education. There is some question as to whether advanced mathematical skills or talent are in fact necessary for fields such as history, English, philosophy, or art. The general higher education and training that takes place in a university, college, or Institute of technology usually includes significant theoretical and abstract elements, as well as applied aspects (although limited offerings of internships or SURF programs attempt to provide practical applications). In contrast, the vocational higher education and training that takes place at vocational universities and schools usually concentrates on practical applications, with very little theory. In addition, professional-level education is always included within Higher Education, and usually in graduate schools since many postgraduate academic disciplines are both vocationally, professionally, and theoretically/research oriented, such as in the law, medicine, pharmacy, dentistry, and veterinary medicine. A basic requirement for entry into these graduate-level programs is almost always a bachelor's degree, although alternative means of obtaining entry into such programs may be available at some universities. Requirements for admission to such high-level graduate programs is extremely competitive, and admitted students are expected to perform well. When employers in any profession consider hiring a college graduate, they are looking for evidence of critical thinking, analytical reasoning skills, teamworking skills, information literacy, ethical judgment, decision-making skills, communication skills (using both text and speech), problem solving skills, and a wide knowledge of liberal arts and sciences. However, most employers consider the average graduate to be more or less deficient in all of these areas. In the United States, there are large differences in wages and employment associated with different degrees. Medical doctors and lawyers are generally the highest paid workers, and have among the lowest unemployment rates. Among undergraduate fields of study, science, technology, engineering, math, and business generally offer the highest wages and best chances of employment, while education, communication, and liberal arts degrees generally offer lower wages and a lower likelihood of employment. Academic areas that are included within the liberal arts include environmental science, great books, history, languages including English, linguistics, literature, mathematics, music, philosophy, political science, psychology, religious studies, science, sociology and theater. Teaching engineering is teaching the application of scientific, economic, social, and practical knowledge in order to design, build, maintain, and improve structures, machines, devices, systems, materials and processes. It may encompass using insights to conceive, model and scale an appropriate solution to a problem or objective. The discipline of engineering is extremely broad, and encompasses a range of more specialized fields of engineering, each with a more specific emphasis on particular areas of technology and types of application. Engineering disciplines include aerospace, biological, civil, chemical, computer, electrical, industrial, and mechanical. The performing arts differ from the plastic arts or visual arts, insofar as the former uses the artist's own body, face and presence as a medium; the latter uses materials such as clay, metal or paint, which can be molded or transformed to create a work of art. Performing arts institutions include circus schools, dance schools, drama schools and music schools. The plastic arts or visual arts are a class of art forms, that involve the use of materials, that can be moulded or modulated in some way, often in three dimensions. Examples are painting, sculpture, and drawing. Higher educational institutions in these arts include film schools and art schools. Higher vocational education and training takes place at the non-university tertiary level. Such education combines teaching of both practical skills and theoretical expertise. Higher education differs from other forms of post-secondary education such as that offered by institutions of vocational education, which are more colloquially known as trade schools. Higher vocational education might be contrasted with education in a usually broader scientific field, which might concentrate on theory and abstract conceptual knowledge. This describes a distinct form of higher education that offers a particularly intense integration with the world of work in all its aspects (including teaching, learning, research and governance) and at all levels of the overarching Qualifications Framework of the European Higher Education Area. Its function is to diversify learning opportunities, enhance employability, offer qualifications and stimulate innovation, for the benefit of learners and society. The intensity of integration with the world of work (which includes enterprise, civil society and the public sector) is manifested by a strong focus on application of learning. This approach involves combining phases of work and study, a concern for employability, cooperation with employers, the use of practice-relevant knowledge and use-inspired research. Examples of providers of professional higher education may include graduate colleges of architecture, business, journalism, law, library science, optometry, pharmacy, public policy, human medicine, professional engineering, podiatric medicine, scientific dentistry, K-12 education, and veterinary medicine. A report titled 'Education at a Glance 2014' published by the Organisation for Economic Co-operation and Development on 9 September 2014, revealed that by 2014, 84 percent of young people were completing upper secondary education over their lifetimes, in high-income countries. Tertiary-educated individuals were earning twice as much as median workers. In contrast to historical trends in education, young women were more likely to complete upper secondary education than young men. Additionally, access to education was expanding and growth in the number of people receiving university education was rising sharply. By 2014, close to 40 percent of people aged 25–34 (and around 25 percent of those aged 55–64), were being educated at university. The Lisbon Recognition Convention stipulates that degrees and periods of study must be recognised in all of the Signatory Parties of the Convention. University governance generally involves input from the Faculty. Here James D. Kirylo, president of Southeastern Louisiana University's Faculty Senate confers with Kevin L. Cope, president of the LSU Faculty Senate and president of the Association of Louisiana Faculty Senates, during a 2015 panel presentation in Hammond on university funding issues for Fiscal Year 2016. Universities may employ a number of people. Depending on the funding, a university typically hires one teacher per 3–25 students. According to the ideal of research-university, the university teaching staff is actively involved in the research of the institution. In addition, the university usually also has dedicated research staff and a considerable support staff. Typically to work in higher education as a member of the academic faculty, a candidate must first obtain a doctorate in an academic field, although some lower teaching positions require only a master's degree. Most of the administrative staff works in different administrative sections, such as Student Affairs. In addition, there may be central support units, such as a university library which have a dedicated staff. The professional field involving the collection, analysis, and reporting of higher education data is called institutional research. Professionals in this field can be found at locations in addition to universities, e.g. state educational departments. Post-secondary institutions also employ graduate students in various assistantship roles. In the US, close to 50% of graduate students are employed as graduate assistants at some point. These apprenticeship-like positions provide opportunities for students to gain experience in, and exposure to, professional roles in exchange for funding of their academic programs. From the early 1950s to the present, more and more people in the United States have gone on to pursue degrees or certificates of higher education. However this has sparked some debate in recent years as some advocates[who?] say that a degree is not what it was once worth to employers. To clarify some advocates[who?] say that the financial costs that universities require from their students has gone up so dramatically that it is leaving many students in debt of loans of an average of $37,172 compared to 2000, where the average debt students graduated with was $16,928. In the United States there is an estimated 44 million Americans with a combined $1.3 trillion student loan debt. Advocates advise parents to not send their children to college unless these children are committed to pursuing their future education. An increasing number of freshman every year drop out of their perspective programs or do not possess the maturity to have a balanced life away from home. However statistics from the U.S. Bureau of Labor Statistics indicate that the college educated are employed at a rate nearly twice that of the national average when compared to high school graduates. The type of degree one pursues will determine how safe and prosperous his/her career path is. A study published by the Pew Charitable Trusts, shows that among Americans ages 21 to 24, the drop in employment and income was much steeper among people who lacked a college degree. "Among those whose highest degree was a high school diploma, only 55% had jobs even before the downturn, and that fell to 47% after it. For young people with an associates degree, the employment rate fell from 64 to 57. Bachelor's degree slipped from 69 to 65." Professor Lisa Kahn of Yale stated that people who graduated from college in the most recent recession were in a position to gain better security than others. Ultimately a survey, the Great Jobs and Great Lives Gallup-Purdue Index report found the type of college that students attend and in some cases even majors they choose have very little to do with their overall success and well-being later in life. What matters more, the index found, is feeling supported and making emotional connections during school. ^ For example, Higher Education: General and Technical, a 1933 National Union of Teachers pamphlet by Lord Eustace Percy, which is actually about secondary education and uses the two terms interchangeably. ^ "Employers Judge Recent Graduates Ill-Prepared for Today's Workplace, Endorse Broad and Project-Based Learning as Best Preparation for Career Opportunity and Long-Term Success" (Press release). Washington, DC: Association of American Colleges and Universities. 20 January 2015. Retrieved 11 April 2017. ^ a b "Risk-Based Student Loans". 2011-09-05. SSRN 1941070. ^ Barshay, Jill (4 August 2014). "Reflections on the underemployment of college graduates". Hechniger Report. Teachers College at Columbia University. Retrieved 30 March 2015. ^ Günther, Karl-Heinz (1988). "Profiles of educators: Wilhelm von Humboldt (1767–1835)". Prospects. 18: 127–136. doi:10.1007/BF02192965. ^ O'Shaughnessy, Lynn (26 July 2009). "The Other Side of 'Test Optional'". The New York Times. p. 6. Retrieved 22 June 2011. ^ Andrew Hacker (July 28, 2012). "Is Algebra Necessary?". The New York Times. Retrieved July 29, 2012. ^ "The Economic Value of College Majors" (Press release). Georgetown University. May 2015. Retrieved 17 August 2016. ^ "Harmonising Approaches to Professional Higher Education in Europe". Harmonising Approaches to Professional Higher Education in Europe. EURASHE. 2013. Retrieved 2014-10-17. ^ Organisation for Economic Co-operation and Development (September 2014). "Higher levels of education paying off for young, says OECD". Retrieved September 11, 2014. ^ "Cornell University Library Staff Web". Retrieved 8 January 2013. ^ Haley, K., Hephner LaBanc, B., & Koutas, P. (2011). New school, new job, new life: Transitions of graduate assistants in student affairs. Journal of College Orientation and Transition, 18(2), 5 - 19. ^ "U.S. Student Loan Debt Statistics for 2017 | Student Loan Hero". Student Loan Hero. Retrieved 2017-12-09. ^ "Student debt increasingly unmanagable - Mar. 8, 2002". money.cnn.com. Retrieved 2017-12-09. ^ Friedman, Zack. "Student Loan Debt In 2017: A $1.3 Trillion Crisis". Forbes. Retrieved 2017-12-09. ^ "Some Career Pathways Require a Four-Year Degree, Many Don't - US News". US News & World Report. Retrieved 2015-10-11. ^ "U.S. Bureau of Labor Statistics". www.bls.gov. Retrieved 2015-10-11. ^ Pérez-peña, Richard (2013-01-09). "Study Shows College Degree's Value During Economic Downturn". The New York Times. ISSN 0362-4331. Retrieved 2015-10-11. ^ "College Grads Question How Much a Degree Is Worth". US News & World Report. 2015-02-10. Retrieved 2015-10-11. Bakvis, Herman and David M. Cameron (2000), "Post-secondary education and the SUFA". IRPP. Davies, Antony and Thomas W. Cline (2005). The ROI on the MBA, BizEd. Douglass, John A. and Todd Greenspan, eds. "The History of the California Master Plan for Higher Education." Forest, James and Kinser, Kevin. (2002). Higher Education in the United States: An Encyclopedia. Santa Barbara: ABC-CLIO. Roszak, Theodore, ed. (1968). The Dissenting Academy. New York: Pantheon Books. x, 304 p.
Wikimedia Commons has media related to Higher education. Look up higher education in Wiktionary, the free dictionary.